France’s prominent economist Thomas Piketty, whose book ‘Capital in the 21st century’ became a major bestseller of 2013, has refused France’s highest possible award, the Legion of Honor, saying the government should better deal with the economy. "I refuse this nomination because I do not think it is the government's role to decide who is honorable. 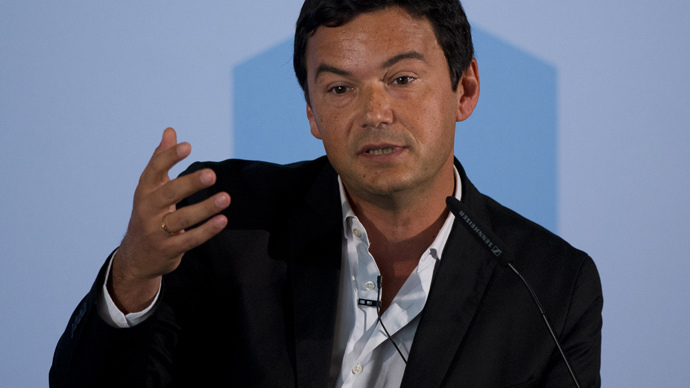 They would do better to concentrate on reviving [economic] growth in France and Europe," Piketty told AFP. The economist was mentioned on the annual New Year’s list of renowned citizens in the government outlet “Journal Officiel”. Among others, Nobel prize-winning economist Jean Tirole was on the list. Piketty’s name hit the headlines in 2013, when his book ‘Capital in the 21st century’ became a worldwide best-seller, selling 1.5 million copies since first publication in French. The book is about wealth and income equality since 18th century, and stresses that the gap between rich and poor is speedily growing. In particular, the book has proven to be extremely popular in the UK and in the US, where Piketty even met with President Obama’s economic advisors. Not everyone was delighted, though: the economist has been a fervent critic of the Hollande government’s tax policies. Legion of Honor is the highest decoration in France which dates back to the beginning of the 19th century. It is awarded for outstanding public service. Among the most famous recipients of the decoration, are Sir Paul McCartney, J.K. Rowling, Walt Disney, Bob Dylan, David Lynch, and many others. Other famous people, who refused the decoration, were composer Hector Berlioz, radiology pioneers Pierre and Marie Curie, philosopher and novelist Jean-Paul Sartre and singer Georges Brassens.